A summertime farmer’s market makes us immediately think of this simple French breakfast sweet. If you haven’t had it before, imagine a cross between a baked pancake and a flan, studded with fresh fruit. The classic version of clafoutis is made with ripe black cherries, pits included, which add a subtle almond flavor to the light, eggy batter. Our version is made with almond flour and seasonal fruit, so the flavors of sweet, bright fresh fruit and almond are still there. Preheat the oven to 350°F. Grease a 9-inch ovenproof skillet with coconut oil. Combine the coconut oil, coconut milk, maple syrup, vanilla, vinegar, flour, baking powder, salt, and eggs in a blender and pulse until a smooth batter forms. Scatter the fruit across the skillet. Pour the batter over it. Bake for 50 to 55 minutes, until the clafoutis is puffed and golden brown. Serve the clafoutis hot with more fresh fruit and lots of coconut powdered sugar. Note: This recipe can be made with any peak-of-season fruit, but we especially love it with cherries, plums, or figs. 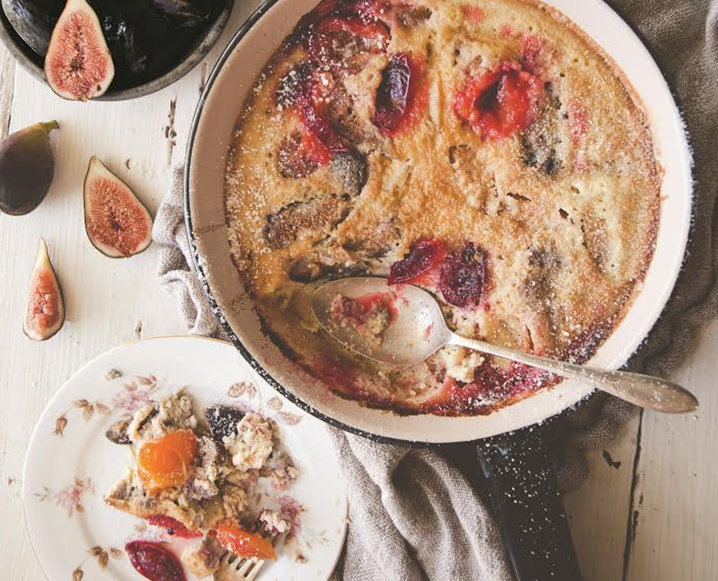 Share the post "This Stone Fruit Clafoutis Has Major French Girl Vibes"
I made this with pears and added some almond extract and it is heavenly!